assume a different and often aggressive set of goals separate from one another. In the UK this is institutionalised in Standard Assessment Tests (SATs) given to 7, 11 and 14-year olds, which provide crude data for the compilation of performance league tables. Likely progress in these tests determine functional arrangements such as patterns of student seating, and their access to additional teaching. But the whole syllabi for GCSE, A Level, degree and post-graduate courses share a myopic belief that individuation is the prime purpose. There is a pragmatic assumption that employment is the quid pro quo of the whole enterprise. Though UK primary schooling has historically been topic or theme-based in its curricular design, SATs have transformed that situation. Much sport, arts, language and humanities work is now banished in favour of the dreaded literacy, numeracy and science drilling. Secondary schooling has traditionally been Balkanised as a set of discrete, mock-academic categories, producing needless myopia in students about skills which can be useful in any learning context – pie charts and role-plays are not for Maths and Drama lessons alone. All their knowledge and skill content could be organised with greater value if knitted into programmes of ‘real learning’. A term’s work on, say, ‘Water’ for first year secondary students – 11 year-olds – could be realised using all the desirable maths, language, science, arts, physical activity, ICT skill and methodological objectives. There is now a compelling reason for this to become an institutional reality, albeit far from the agendas of mainstream political parties, school providers and exam boards. The Rethinking Schools (RS) collective of educationalists in north America has its origins forty years ago in a complete negation of what capitalism thinks education is for. In publications, which have always been classroom-tested by brave teachers finding progressive spaces in gradually more hostile circumstances, RS has been a beacon of hope for all English-language educators. Now RS has produced a wonderful 400-page teachers’ handbook focussing on the most crucial topic for students’ futures – the fate of our planet. Their core assumption is that learners can work collectively for their mutual benefit on curricula that are socially derived for a common wealth. The opening chapter makes the case for an integrated curriculum to match the inter-connected web of ecological issues facing young peoples’ existence. Many UK readers will appreciate the inclusion of Leon Rosselson’s lyrics for ‘The World Turned Upside Down’ here. Christian Parenti’s ‘Reading The World in a Loaf of Bread’ connects the loaves brandished by Tunisian protesters in the Arab Spring of 2011 with an imminent global food crisis. The second chapter on ‘Grounding Our Teaching’ highlights the pedagogic obstacles to and gains from this approach. Field trips to wonder at and directly engage with our natural world take lots of planning time and variable lengths to travel from more urban areas. Ann Pelo recommends revisiting the same sites regularly to observe seasonal and natural cycles rather than skimming lots of sites. Kate Lyman reports on lessons derived from the resident black and yellow garden spider Charlotte in her classroom. Doug Larkin explains the very reasonable notion that many of us experience a ‘nature deficit disorder’ experiencing and knowing very little of life’s processes. 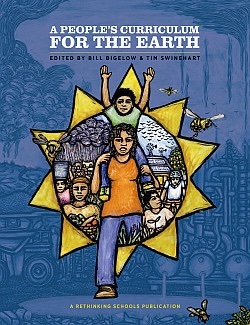 Subsequent chapters address crucial topics: ‘Facing Climate Chaos’, ‘Burning The Future: Coal, Oil, Natural Gas and Fracking’, ‘Teaching In A Toxic World/Teaching In A Nuclear World’, and ‘Food, Farming, and the Earth’. In each are a selection of speeches, extracts from the press, books and essays, research data/reports, reviews of relevant DVD and other resources, poems and lyrics, as well as cartoons, drawings and photos, all texts sprinkled with teaching ideas. Educating a child that chicken does not originate in cellophane-wrapped plastic trays on a store’s cold shelf, or that the pineapples and green beans probably grew in plantations thousands of miles away, and that there may be a few foods growing wild in their neighbourhood that they have not noticed, can intrude on sensitive domestic issues of household income and parenting paradigms. Nevertheless four authors set out the central role of food production for those international movements which come together under the banner La Via Campesina. Most refreshing in RS’ output is its insistence that teaching is a politically partisan activity, something which remains explicitly outlawed in the UK. “We believe there’s an important difference between being partisan and being biased,” explains an introductory note. This last point is crucial. One of the dangers of tackling such global life-threatening questions for young people is that the end result can be a doleful fatalism in which students acquiesce in their own powerlessness. Their political disenfranchisement is a necessary nettle to grasp. In my own teaching experience “There’s nothing we can do about corporate greed and destruction,” can be a real student response to grappling with such global ecological questions. Thus some level of contrary activism is essential in preventing such a curricular strategy backfiring. These may be modest and locally focussed. They may also involve the articulation of quite feasible alternative economic, energy and social models. But this book offers plenty of ways to inspire without demoralisation, and empower with humility. Bill Bigelow suggests starting a class on climate issues by the teacher lighting up a cigarette then harnessing the immediate storm of student protest for as long as it is valuable! Issues of personal and public health, scientific data and social responsibility, choice or consent all get usefully addressed. One unfortunate omission however is any reference to the UK Campaign Against Climate Change’s One Million Climate jobs initiative. This pamphlet is now in its third edition and sets out a costed way in which not only practical measures reducing CO2 emissions can be undertaken but the allied social malaise of unemployment could also be reduced. It has the support so far of eight UK trade unions. So this book is a rich resource for future teachers, and teaching our future, at all levels. The culture of fear, fierce competition and teacher burnout now typical of UK schools has to end. But like climate chaos itself we are often challenged by the guilty to produce alternative and better blueprints for success. They are hopeless but we are not. UK teachers have to collectively challenge the pointless, egotistical curriculum that successive governments strangle us with. A People’s Curriculum For The Earth provides a field of plentiful ideas for shaping a much better school and world. « Why ALL members of the NUT and NASUWT must support the strike.